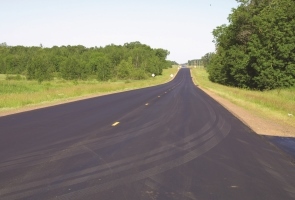 Heavy-duty woven driveway fabric helps a gravel driveway resist ruts and potholes while significantly increasing time between resurfacing. 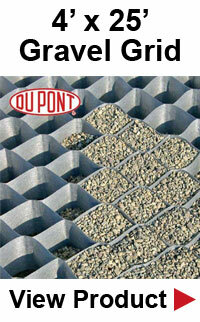 For a very long lasting gravel driveway install our fabric with Ground Grid which greatly reduces gravel migration. When placed underneath asphalt or concrete driveway, the fabric helps to reduce cracking which extends the life of the driveway. Our selection of driveway fabric meets most DOT specs. Driveway fabric is an ideal material for building a driveway with a supportive base layer which will help to create a more stable surface which will resist ruts and potholes. Woven fabrics allow for the passage of water where non-woven fabrics are filters; both serve different purposes. 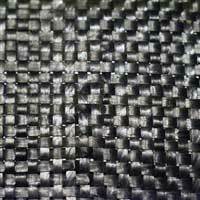 Our fabric is a woven stabilization fabric with high high durability. These fabrics offer a critical function that allows water to pass through and not damage your driveway. Non-woven fabrics, are often suggested, by some companies, but are not a good choice. 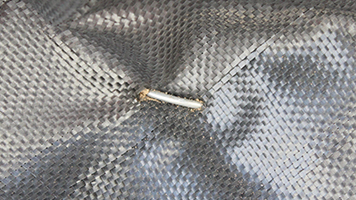 Non-woven fabrics serve as a filter product and are not good for stabilization. Also, non-woven fabrics stretch more than woven fabrics, making them less attractive for driveway use. First, you must prepare the surface by removing any debris and protruding objects such as rocks and stumps that will tear the fabric. Next you are going to level the surface without creating a bathtub effect that could hold water. If you have an area that always retains water, use a pipe or drain to remove it. Take the fabric and lay it directly on the now prepared surface. You do this by rolling it out flat, as you need to minimize any creases and folds. If needed, overlap the fabric by 1 to 3 inches and if needed, use pins or staples to hold the fabric in place. Using stones, dirt or other somewhat heavy materials will be enough to hold the fabric in place for dumping the aggregate (rock). Apply the gravel in place and compact it in 6 to 8 inch lifts. If needed, dump trucks and/or loaders may be driven directly on the fabric without harm. However, avoid any quick stops, starts or turns. The proper method is to dump the stone onto the stabilized fabric then push it into the fabric for protection. You want to create a slight crown in order to provide water drainage on the driveway sides. The aggregate should be crushed and angular with a one inch diameter and 10% dust. Limestone is a good choice but other stone material will work just as well. Driveway fabric removes the need to use stones larger than one inch in size but do not use rounded stones. You do not want to spread gravel on a soft, mushy ground. Soil that has leaves, grass, roots, weeds and other debris will cause a spongy surface that will lead to trouble down the road. You must get rid of all topsoil and strip the soil all the way down to hard rock. This will make for a much more stable and dependable bed. You can place the topsoil somewhere for later use. If your driveway is not properly leveled, drainage is going to become a problem, allowing water to erode and destroy it. You will have nothing but a mud hole as silt, from below, comes up to the gravel. The silt will loosen the gravel pieces, they will lose their friction and start to weaken and separate. Under these conditions your gravel will be a total and complete mess. To prevent this from happening, place a layer of Geotextile fabric between your subsoil and the bottom layer of gravel. One option to keeping the gravel in place on your drivewway is to use a gravel paver product which prohibits the gravel from migrating, resists rutting and provides a very stable surface. Gravel pavers are available in a variety of different shapes and sizes and are composed from either plastic or a heavy duty geotextile. Another option is to install sides to the driveway. The side forms can be constructed of wood or you could opt to place a retaining wall of brick or concrete blocks. These materials will also prevent spreading outside the parameters of the driveway. Your base layer of gravel pieces should be at least 3 to 4 inches in diameter or you will experience shifting and sinking from the weight of your vehicle on top of it. The pieces must be angular with sharp edges, rounded pieces are not capable of locking into place with adjacent pieces. Sharp-edged pieces are almost as solid as a single large rock. Gravel pieces laid on the final top layer should not be any larger than a golf ball. The total thickness of your driveway, with layers of different sizes of gravel, should be approximately 12-inches. While your driveway should be composed of various layers of gravel, each layer must be compacted. If not compacted properly, the driveway will not keep its shape. Each layer should be approximately 4-inches thick and the gravel pieces should be smaller than those of the layer below it. You must compact each layer as you lay them down by tamping with a hand operated roller or a machine. If done properly, you will have a great driveway that will last for many years. Be careful not to overlook steps that must be taken. Building a driveway will take a little time and some work, doing a poor job will only lead to a complete mess that will have to be completely done over. Take each step one at a time, do not skip steps and make sure you have the proper materials required.